For a while, Hing Kee had been the go-to place for hand-pulled noodles. The trained chef would stand in this same window (seen below) pulling noodles in the dining room so customers and passerby's can stare in awe. Unfortunately, this speciality stopped and was replaced by another art form... making the coveted Xiao Long Bao, aka the soup dumpling. In that same window and dining room kitchen, a lady hand makes each soup dumpling to perfection before meticulously steaming them until cooked. We decided to just eat the soup dumplings so it is hard for me to give a true rating. The staff was a little too attentive with some of them essentially staring at you while you eat. This is sort of uncomfortable. Also, why pour huge cups of tea that will just get cold? Please switch to the traditional shorter cups. All in all, the dumplings were good so I could look past the mediocre service. But after trying several other places with xiao long bao, I reconsidered and gave a strong 3.5-mile rating. 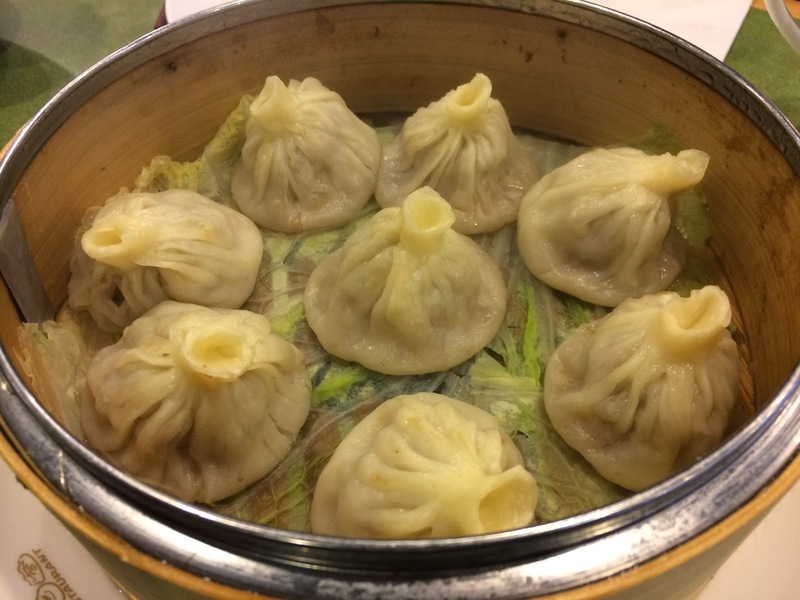 The must try dumpling becoming easier to find in Chicago is the Xiao Long Bao. Hing Kee had two options. The first was the traditional pork meat filling. The dumpling has the typical noodle-like shell filled with a pork meatball and enough broth for one bite of "soup". These come out extremely hot (temperature-wise), so make sure to pop a small whole in them and let the steam out before eating. Otherwise, you WILL burn your mouth. I personally like to add a little strip of ginger and a little soy sauce to my dumpling. For a dollar more, you can get the crabmeat and pork xiao long bao. Just like the first, this soup dumpling is made by hand. The same dumpling with crab meat is steamed and brought to your table. Surprisingly, the crab flavor is prominent enough to know you are eating crab. The texture isn't different... still a very hot soup dumpling. I will say, the amount of broth inside each dumpling does vary. Some have just enough while others are a little on the dry side. None of them had an abundant amount of broth. - Come in just for the soup dumplings. It is pretty common for guests to come and eat a couple orders of soup dumplings and nothing else. - Cai also offers Xiao Long Bao, but they don't come close to Hing Kee's. Try here first for a better than average dumpling.